Iğdır Province (Turkish: Iğdır ili) is a province in eastern Turkey, located along the borders with Armenia, Azerbaijan (the area of Nakhchivan Autonomous Republic), and Iran. 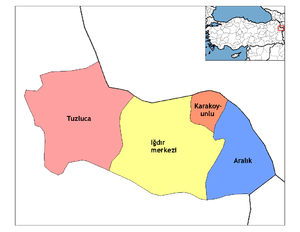 Its adjacent provinces are Kars to the northwest and Ağrı to the west and south. It occupies an area of 3,587 km² and population of 184,418 (2010 est. ), it was 168,634 in 2000 (up from 142,601 in 1990). It was created from southeastern part of former Kars Province in 1993. Turkey's highest mountain, Mount Ararat (Ağrı Dağı) is in Iğdır, but much of the land is a wide plain far below the mountain. The climate is the warmest in this part of Turkey, cotton can be grown in Iğdır. Iğdır is where Noah is said to have thrived following the flood. The closed border with Armenia follows the Aras River. 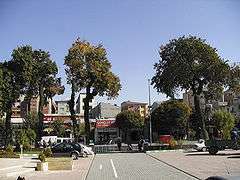 The provincial capital is the city of Iğdır. The majority of the province's population is Kurdish, with Azerbaijanis making up the remainder. However, the majority of the population was historically Armenian. According to the Russian Empire Census in 1897 Iğdır had a population of 4,680, of which 3,934 (84%) were Armenians, and 559 (12%) were Russians. Archaeological research has uncovered Hurrian settlements in the Iğdır region going back to 4000 BC. The area was part of the Urartu kingdom circa 800 BC. There is a Urartu statuary in the area. It remained under Urartian control until its transition to the Median Empire, Persian Empire, Alexander The Great, Orontid Dynasty of the Kingdom of Armenia. Seleucid, Parthian, Roman, Sassanid and Byzantine forces were prominent from the 4th century BC, followed by the Arab armies of Islam in 646. Turks, Georgians and Mongols fought through here for 400 years from 1064 onwards until the area was settled by Kara Koyunlu and then Ak Koyunlu Turkic tribes in the early 15th century. For centuries, a constant warfare ensued between the two arch rivals, the Ottoman Empire and the Persian Empire from 1534 until 1746. The region, most of the time remaining in Persian hands, was officially ceded once again in 1746, when subsequently most of its land within the province of Iğdır today became part of the Erivan khanate, a Muslim principality in Persia. The northern part of the province remained in Persian hands until after the Russo-Persian War, 1826-1828 when it became part of the Russian Empire under the Treaty of Turkmenchay. Under Russian administration, the area became the Surmali uyezd (with its capital at the city of Iğdır) of the Armenian Oblast and later the Erivan Governorate. The southern half of the province remained in Ottoman hands through most of the 19th century but was also brought within the Russian Empire by Russo-Turkish War of 1877-78. By the end of World War I, the whole area was under Russian control and Iğdır came under the administration of the First Republic of Armenia as part of the Ararat province but upon the arrival of the newly founded Turkish army, Iğdır was ceded to Turkey by the Soviet Union in the Treaty of Kars. A substantial Armenian population remained in the area throughout this history of struggle between great powers. Armenians formed the ethnic majority in the city of Iğdır itself until 1919–1920 when most either died or fled due to starvation and Turkish–Armenian War. It was part of Beyazıt Province between 1922 and 1927, part of Ağrı Province (created after moving center of Beyazıt one from Beyazıt to Karaköse) between 1927 and 1934, and finally part of Kars Province between 1934 and 1993 before becoming separate province. Today, Iğdır has a mixed population of Azerbaijanis and Kurds, both of whom comprise roughly half of the population, the former primarily inhabiting the north and east of the province and the latter inhabiting the south and west of the province. Political scientist Nicole Watts suggests a majority of the province's population are Kurds (as of 2010). The Kurds are Sunni Muslims belonging to the Shafi school while Azerbaijanis are Shia Muslims belonging to Ithnā‘ashariyyah school. The rural areas of Iğdır province have a higher population density (30 inhabitants/km²) than those of neighbouring provinces. The caravanserai of Zor, believed to have been built by an Armenian architect in the 13th or 14th century, is located 35 km south-west of the city of Iğdır, and is named after the nearby village of Zor. It was one of halting places along the trade route between northern Persia and Georgia. Caravans used to stay over-here before passing over the Çilli pass. Restoration works have begun on the structure which has been put under protection since 1988. The ruins of an Armenian church was once located in the same area, but today nothing remains of it. Surmari castle, 25 km west of the city of Iğdır, on the road to Tuzluca, in the village of Sürmeli, is the site of the medieval Armenian town of Surmari. However, it is currently inaccessible due to border restrictions. Statues with Ram Heads, Cementer stones with ram heads existing almost in all old cementers in Iğdır Plain are remnants from Kara Koyunlu period. These cementers of brave, heroic persons and young persons who had died in youth age. Aras Bird Research and Education Center, One of only four active bird research and banding (ringing) stations in Turkey. 204 bird species have been recorded so far in the wetlands along Aras River, Yukari Ciyrikli, Tuzluca. Bird enthusiasts can volunteer or visit to experience the diverse birdlife and traditional village life. From Kars to Igdir, turn immediately right 10 meter before the Aras bridge and drive 4 km to Yukari Ciyrikli village. ↑ (Russian) Первая всеобщая перепись населения Российской Империи, 1897 г. (Erivanskaya Guberniya), N. A. Troynitskii, Saint Petersburg, 1904, p. 144.